Lucius Pinarius Scarpus was a grandnephew of Julius Caesar by one of his sisters, Julia Major. His cousins were the consul Quintus Pedius, Octavia Minor (the fourth wife of Marcus Antonius), and Octavian. He struck coins in 31 BC in conjunction with Marcus Antonius. Little is known on Scarpus' early life. He is first mentioned in the ancient sources when Caesar was assassinated in Rome in March 44 BC. In the will of Caesar, Scarpus received one eighth of the property of the dictator, the same amount as Pedius. The main heir of Caesar was Octavian, who received three quarters of the property of his great uncle. But Scarpus and Pedius also assigned their inheritance to Octavian. He later became an ally of Marcus Antonius. After Antonius and Cleopatra were defeated by Octavian at Actium, they sailed back to North Africa. Antony sent messengers to Scarpus for help, but he refused to see Antony’s messengers and put them to death. Instead, he changed sides. When Antony and Cleopatra died, Octavian became the new Roman master and then emperor. Augustus had appointed his cousin as the Roman governor of Cyrenaica. 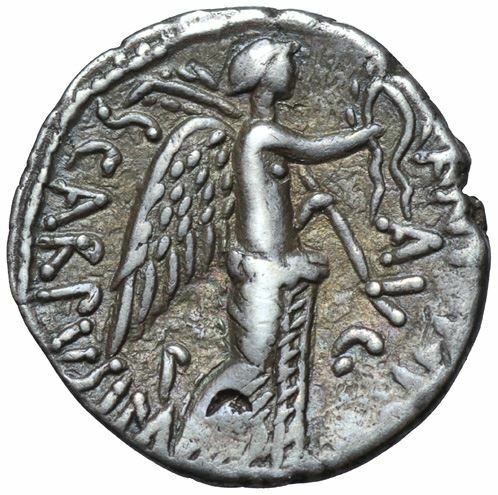 Scarpus, as he did for Antony, became a moneyer and had issued various coins bearing Augustus’ name. On these coins, Scarpus had his name inscribed as an issuer of the coins. Beyond that, nothing is known of Scarpus.